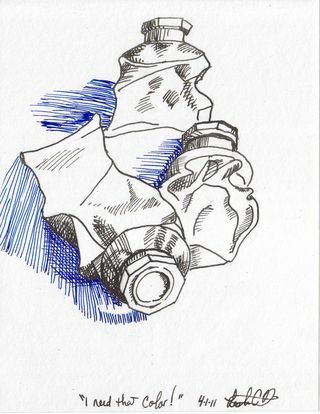 Drawing-a-Day: I Need that Color! This is the 4-1-11 drawing titled “I Need that Color!” It measures A5 or 5.75×7.5 inches. I did a quick sketch with pencil and then used a Lamy Safari with a B nib filled with Noodler’s Black ink for the paint tubes and added the shading with a TWSBI M Nib and Private Reserve Electric DC Blue ink. This entry was posted in Uncategorized and tagged daily, draw, drawing, drawing a day, ink, pen, sketch on 20110402 by leslie.